Every holiday season, the Morgan displays Charles Dickens's original manuscript of A Christmas Carol in Pierpont Morgan's historic Library. 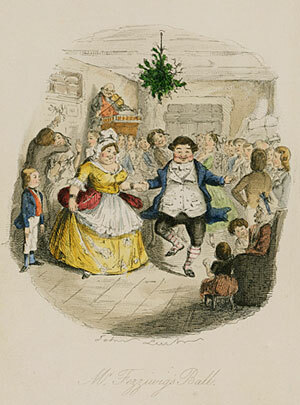 Dickens wrote his iconic tale in a six-week flurry of activity, beginning in October 1843 and ending in time for Christmas publication. He had the manuscript bound in red morocco as a gift for his solicitor, Thomas Mitton. The manuscript then passed through several owners before Pierpont Morgan acquired it in the 1890s. Travel back to Valley Forge on Christmas day, 1777, when General George Washington penned a letter to Elbridge Gerry, imploring him to use his influence in the Continental Congress to support the suffering troops during the long, cold winter campaign against the British. Explore the season's impact upon literature in the handwritten manuscript of Truman Capote's comical early story, A Christmas Vacation, written when he was only eleven years old. Discover how the modern American concept of Santa Claus was shaped by Clement Clark Moore's poem 'Twas the Night Before Christmas, which first appeared in book form in the 1825 almanac on view. Read Henry David Thoreau's 1857 journal entry in which he describes being entranced by the "glorious" frost on a storefront window displaying holiday gifts. See original sheet music from some of the most memorable holiday tunes composed by American songwriters during the first half of the twentieth century, including Irving Berlin's White Christmas (1942), Mel Torme's The Christmas Song (1946), and Meredith Wilson's It's Beginning to Look a Lot Like Christmas (1951).